The first psalm is a fitting introduction to the entire Psalter. It can truly be called a wisdom psalm because it presents two distinct paths we may choose in life – the wise or godly path, and the path of the wicked or ungodly. But clearly, only one of these paths leads us into the delight of learning and obeying God’s Law and enjoying His blessing on our lives. That person is “blessed” who avoids the kind of casual (suggested by “walk”) or intimate (suggested by “sit”) association with mockers that may lead one astray. 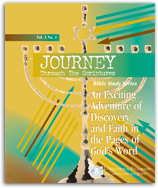 The “delight” we find in God’s Word is a strong theme in Jewish teaching. While to others the commands of the Torah may seem like a burden, they are the delight of the pious Jew. In Psalm 1 – and indeed, in all of the psalms – God offers mankind the choice between a fruitful, prosperous life or one that leaves nothing behind but chaff. There is an interesting parallel between verse 3 and Jeremiah 17:7–8. Both passages speak of a tree that draws its life from the water by which it is planted. This is the picture of the person who rests upon God and His provision. What does it mean to "sit in the seat of mockers"? How can we meditate on the Word of God? Why do you think the psalmist drew such a strong contrast between the righteous and the wicked? According to verse 6, what is the reward we can expect when we seek to follow the Lord and live in a way that pleases Him? The key to enjoying the blessing and prosperity described in Psalm 1 is to honor God and His Word by the way we live. If you honor God in both the large and small decisions of life, meditating on His word and seeking guidance through its pages, He will bless you for doing so.